The Itty Bitty Kitty Committee: What Exactly are You Doing, Linus? What Exactly are You Doing, Linus? It kind of look like he's flashing the world. But I would like to think he's just trying to embrace it. Either way, Linus. You're adorable. PS... I'm giving away a copy of my new book/kit over on my craft blog. If you would like to throw your ring into the hat... click HERE. What an adorable little puff of fluff! Awww - and in the second picture you can see his brother standing next too him - too cute!! Linus appears to have made friends with gravity today. What a beautiful boy! You are killin' me here. I am so in love with that kitten. He's a kitten cloud! An adorable kitten cloud. Your neighbors are the luckiest neighbors in the universe....Everyday a kitten show of adorabbbbbble cuteness and happiness. Awww! Unbearably cute, Linus! <3 He's just such a sweetheart. OK, now you've done it. This kitten "medley" is so cute that I've refrained from posting gasp!-ing commentary. But that first image is just about the cutest thing I've ever seen in my life. And I'm old. The Tail! The little tail and the white cottony fluff! He's so sweet. HILARIOUS, I have to go reapply my mascara because I was laughing so hard. The Medleys are the funniest kittens! Laurie are you sure Nigel Frost doesn't want a mini-me brother???? Is he getting floofy lessons from Professor Butterbean? Whoever made the comparison to the pope in his white robe... you made me laugh so hard! Oh my gosh, I just noticed Kirby in the reflection there. Both of them are meerkating! Good heavens...could he be any more adorable?!?!?! Thank you, thank you, thank you for my Linus fix. You've had some cuties but I am totally besotted with him. I was having withdrawal! @Marlene: "meerkating" as a verb? I love it! I, too, would like to be a neighbour or seated just under the window where i could watch this aalllll day long. Just gorgeous! Awww! I love little Linus:-) He's just too cute! Pretty please, may I bring my comfy lawn chair and popcorn and a lap blankie and my camera and camp out in the front yard? If I ask permission, I am not stalking....am I? Oh my word...I actually laughed so hard at that picture and your caption Laurie. This is much needed levity during exams. How do you manage to accomplish ANYTHING with all these fluffy little distractions? It's like seeing Nigel Frost as a kitten all over again! LOVE! awwww..Little Linus..you make me smile..I LOVE YOU you little cutie baby..yes, flash the world outside with your cutiness and fluff..
Oh, Baby Linus! How sweet of you to put on a show for the neighborhood! Was there some singing and dancing, with Kirby's help? I sure wish I'd been there! He looks like a little kitty marshmallow! So cute! He is posing like a prairie dog like his brother!!!!! Well, his own version! All the better to scout out the world below, Laurie!!! Oh Linus...will you be mine? Is Linus' tail extra short or is it curled up a bit in the pic? What a boy- totally irresistible. Like I could resist. Resistance is SO futile. Awwwww .. Linus is so smoochie and adorable and cute. P.S. His little hands! Egads!! I love all your kittens, but Linus is my favorite. Love, love, love that marshmallow kitty! The book is beautiful! Thanks for having Charlene sign it also. squeeeeeeee! Oh my goodness, I just love love love him! We have heard it through the grapevine that ever since the very start you were extremely interested in the Outside World. We have a couple of especially cute pictures of you, peeking under the bedroom door, wishing so hard you could find out what was out there. 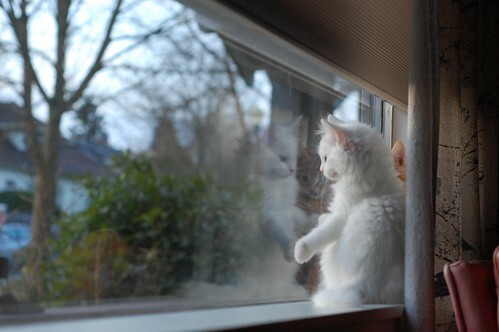 I'm so glad that you get to finally take a look out there. 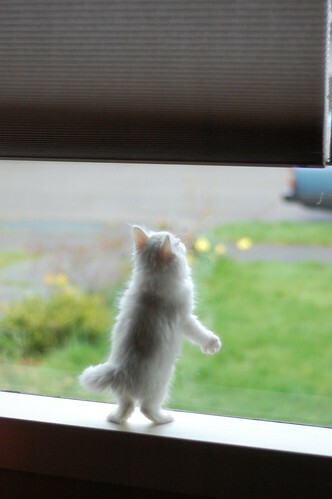 It's a big world, and scary, but hopefully you'll have a wonderful fur-ever home with lots of windows so you can continue your sight-seeing! That first picture reminds me of the cat in Simon's Cat cartoons. Is Linus as pudgy as he looks or is that short legs and a whole bucketload of floof? Laurie- Is the 'stubby tail' an optical illusion in the photo? perhaps he is part manx with his 'shorter front legs' and rabbit like behind and awesome stubbage tail-io? If it is ...I have to call Dibs on this one! mine mine mine!!!! :) so beautiful!!! Oh my goodness, I'm in love. I've been telling myself that I can't afford a kitten right now on student loans but this is weakening my resolve. I ♥ Linus. Do. Want. Floofmallow. Kitteh.